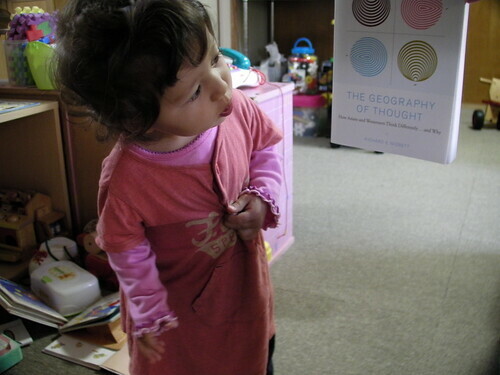 May and The Geography of Thought, a photo by timtak on Flickr. Richard Nisbett's opus, "The Geography of Thought" is already a classic in the field of Cultural Psychology. Backed up with lot of experimental data, such as the fact when shown a picture of a fish tank Japanese are more likely to talk about the tank than the fish in it, Professor Nisbett demonstrates that Americans analyze the central features of their environment, whereas East Asians are more likely to see the world wholistically, taking in the context. This tendency to emphasise context among East Asians is, Nisbett argues, due to differences in Argricultural system. Wet rice farming in East Asia encouraged East Asians to cooperate in irrigation systems, and being dependent upon social systems themselves, see the world as being composed of things also dependent upon their environment. Westerners were however able to do argiculture which did not require such high levels of cooperation and cosequently saw themselves and their environment as composed of discrete, independent monads. The work in the differences in conception is being continued by Takahiro Masuda and the data is now so extensive as to make cognitive difference irrefutable. I have two problems with the explanation of the origins of the difference that Nisbett provides. Firstly, I don't think that it is true that rice farming is more cooperative than the cows wheat fallow rotation system used in Europe. According to Bray's "The Rice Economies," wet rice farmers, who often use small private ponds for irrigation, were able to be more independent of their peers than wheat farmers who, due to the requirement for cooperation with cattle farming, developed specialisations, and being less isolated and less intensive achieved economies of scale. Secondly, while I agree that agricultural systems do have had some impact on psychology, this explanation is too one-sidely Asian and contextual for me. Such explanations (Watsuji's Monsoon Rice Farming Culture, Tamaki's The Philosophy of Water etc) are tremendously populare in Japan, precisely because Nisbett is right to point out that East Asians see behaviour as a result of contextual factors. The Japanese love environmental interpretaions of cultura and human behaviour. Perhaps Professor Nisbett will one day write another book called, "The Thought of Geography." Former Encyclopedia Britannica Salesman Tells Japanese How to Have more Confidence, a photo by timtak on Flickr. Just as post-war Japanese admire Western looks, they also attempt to import Western psychology. As a result, Japanese today consider themselves ugly if they have traditional Japanese looks(Knowner, 2004). The results of importing Western popular psychology, without the religio-cultural framework, may be even more disasterous. "Put all negative thoughts out of your mind" the author urges. What of the beauty of reflecting upon ones mistakes (hansei) in order to achieve self improvement (kaizen)? "Praise yourself when you achieve your goals", he says. In the traditional view of things in Japan, the important praise is the gratitude that one gets from others, and self-praise is just "self-satisfaction" (jikomanzoku, a derogatory term). "Setting your goals too high will result in loss of self image" he says. Indeed Westerners are inclined to give up at things that they fail at, and seek tasks that suit their 'individual' aptitudes, wereas Japanese are more inclined to believe that human potential has no limits (Heine et al, 2001). Sadly, the Japanese feel that they need more confidence, so the book has sold 110,000 copies. Perhaps this book is the intellectual equivalent of hair dye, or eyelid glue. If I were Japanese I would read it with a pinch of Soy Sauce. Image copyright Hitoshi Aoki (2009)"Jishin no Tsukurikata (How to make self-Confidence)"